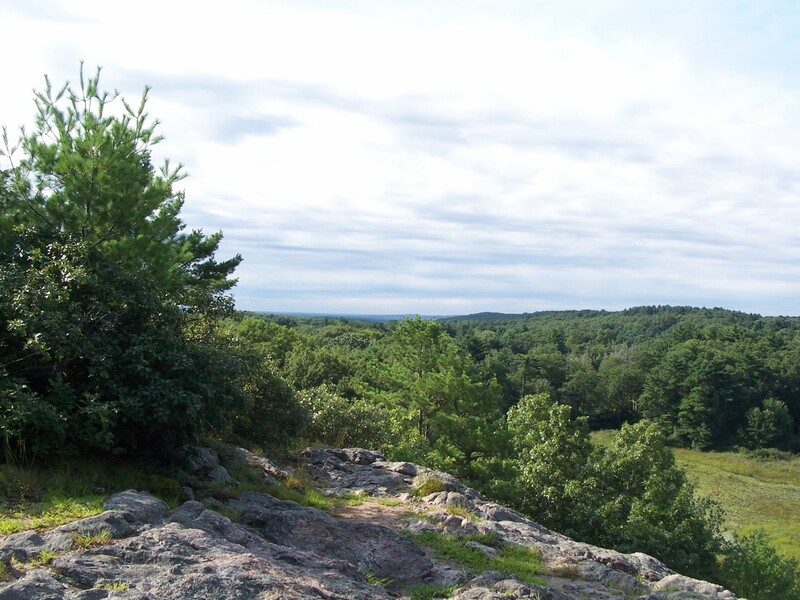 Southern New England is not known for its spectacular views, but there are a few special places in this area that provide nice overlooks, and Joe’s Rock in Wrentham, MA is one of them. Four hundred ninety feet in elevation, Joe’s Rock provides an unrestricted sightline northeast toward Boston and southwest over the Rhode Island countryside. Directly below Joe’s Rock lies a small pond. On a recent visit we saw in the water over thirty ring-necked ducks and a lone bufflehead. A flock of wild turkeys scurried through the woods. A nearby wetland sheltered countless wood frogs that filled the air with their duck-like calls. Children over four should manage at Joe’s Rock quite well. Attempting to traverse these trails with a child in a stroller is not recommended because the trails are crisscrossed by numerous tree roots. Immediately as one leaves the parking area, the trail crosses a small stream, which must be traversed by walking along a foot-wide board. The water is not deep, but it will provide a good soaking if one isn’t careful. The trails immediately fork right and left. The right fork heads to the top of Joe’s Rock, the left meanders along the shore of the pond. There is an additional trail that goes directly underneath Joe’s Rock, reached by heading up as though to climb toward the top, then Looking on the left for the trail that heads down to the shore. The Wrentham Conservation Commission has provided benches along the pond and picnic tables for summer enjoyment. Dogs on leashes are welcome. There are no toilets available—permanent or portable. Directly across the street from Joe’s Rock is Birchwold Farms, 129 acres of conservation property of varied landscape. Trails skirt the huge open field and lead off into the woods across a steeply arched bog bridge with no railings. In these woods are interesting rock outcroppings, some large enough to tempt one to play “King of the Hill.” In the midst of the hayfield is a large stand of trees, underneath which is a quietly flowing stream—at least in springtime. From Crooks Corner in South Bellingham at the intersection of Route 126 and Pulaski Boulevard, turn onto Wrentham Street, which runs between Dean Bank and Walgreens. Turn left at the first intersection onto Wrentham Road and continue straight till it ends in a “T ” at Route 121 in Wrentham. At this point Wrentham Road has become West Street in Wrentham. Across the street Birchwold Farm hayfields are visible. Turn left onto Route 121 and look for the first driveway on the right for the entrance to Birchwold Farm. A large dirt parking area is just off the road. One hundred feet past the Farm entrance, the paved parking lot for Joe’s Rock is on the left. Can anyone give me any information in regards to what the indian legend associated with this rock? Good luck. Let us know what you learn! Neat piece! I hope I can see Joe’s Rock sometime.